LOS ANGELES -- An earthquake has shaken Southern California, and authorities say there have been no reports of damage or injury. The United States Geological Survey reports that the quake with a preliminary magnitude of 4.0 occurred just after 2 a.m. Thursday. It was centered about eight miles northeast of Trabuco Canyon, California, which is located 31 miles southeast of Anaheim. The quake had a depth of about 6 miles. The shallow depth could be why mine worker Jesse Valdez thought it was initially a landslide, CBS Los Angeles reported. "I felt the ground shake, a sound like an explosion, felt a rumble, and next thing I know everything was shaking all over the place," Valdez said, as he ate breakfast at Corky's Kitchen and Bakery in Rancho Cucamonga. 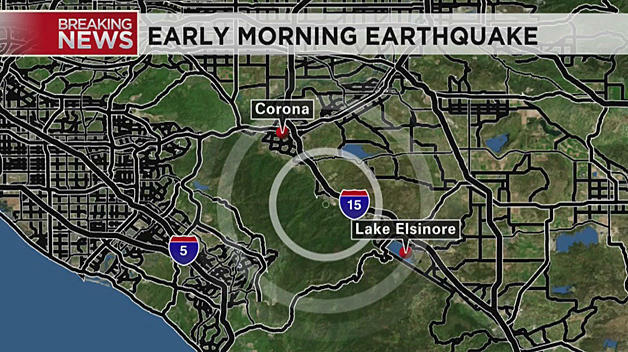 CBS Los Angeles reports the quake was felt as far north as Santa Clarita and as far south as San Diego. #Earthquake: A magnitude 4.0 temblor struck at 2:09 this morning, 8 miles northeast of Trabuco Canyon. The Orange County Sheriff's Office tells The Associated Press that there have been no reports of damage or injury. Still, hundreds of people who were jarred awake took to Twitter to discuss the earthquake. #Earthquake #Corona that was vicious and quick. Felt like the walls were going to come down. The Southern California earthquake comes two days after a magnitude 7.9 quake in the Gulf of Alaska triggered a tsunami warning for Alaska's coastal communities.